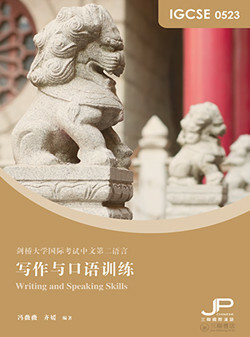 Chapter 1 briefly introduces the Chinese as a second language (0523) course to help students know about the exam requirements for the new 2018 syllabus which has the first exam in 2020. This chapter also includes the basic text formats, language points, conjunction words and question words to help students well prepare for their writing and speaking exams. the similar mistakes in their own writing, the book includes some examples of essays with typical mistakes and marking scheme. At the end of each theme, there are “question bank” and “the most frequently used words on the theme”. Students can practice writing according to the questions. “Practice makes perfect”. More practice will make students’ writing skills improve. Chapter 3 focuses on the oral exam. This chapter is also based on the four themes specified in the course outline. For students to have a clearer understanding of the oral exam mode, the book gives a full transcript sample of the oral exam including part 1 “presentation”, part 2 “follow-up questions and answers” and part 3 “general questions and answers”. Apart from this, the book also has plenty of model transcript texts on different themes as well as a “question list” so that students can well prepare for their oral exam.